–Bill Brand, Chief Marketing and Business Development Officer, HSN, Inc.
To successfully apply marketing analytics, executives must orchestrate elements that transcend multiple perspectives and organizational silos. 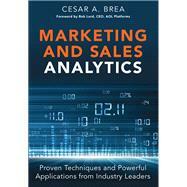 In Marketing and Sales Analytics, leading analytics consultant Cesar Brea shows you exactly how to do this. Brea examines the experiences of 15 leaders who’ve built high-value analytics capabilities in multiple industries. Then, building on what they’ve learned, he presents a complete blueprint for implementing and profiting from marketing analytics. Whether you lead, practice, or rely on marketing analytics, this guide will help you gain more value–with less frustration. CESAR A. BREA (Dover, MA) is founder and managing partner of Force Five Partners, LLC, a marketing analytics consulting firm that helps clients with complex multi-channel, increasingly-digital sales and marketing operations build their marketing analytics capabilities. Brea and Force Five have served clients including T. Rowe Price, Kohl's, Sallie Mae, Condé Nast, IDG / Network World, Harvard University, FAO Schwarz, Boehringer Ingelheim Pharmaceuticals, and the Minnesota State Colleges and Universities, among others. He previously led the digital media and marketing practice at Monitor Group (the international strategy consulting firm founded by HBS professor Michael Porter); led sales and marketing for Razorfish (the world's largest digital advertising agency); helped to build and sell two Internet software firms (ArsDigita, where he was VP of Marketing and Business Development, and Contact Networks, where he was CEO); and led consulting engagements with high-tech clients for Bain and Company. He graduated with honors from Harvard, and earned an MBA with honors from Dartmouth's Tuck School. Systematically plan and lead the implementation of high-value marketing analytics in your organization.